Little Waldingfield History Society was delighted to welcome Jenny once again to the Parish Room, to take us through the history of the Orthodox Christian church in Russia, and what a fascinating 1,000 years of history it turned out to be. The story begins in the Kievan Rus (a loose federation of East Slavic tribes in Europe, now Belarus, Ukraine and Russia) in the late 9th century, with the introduction of Christianity by Greek missionaries from Byzantium. By the mid 10th century, a Christian community existed among Kievan nobility, although paganism continued as the dominant religion. Influenced by his Christian grandmother (Princess Olga of Kiev, the first Kievan Rus ruler to convert) and a proposed marriage alliance with the Byzantine imperial family, Jenny told us that Prince Vladimir of Kiev (Vladimir I, Vladimir the Great and Saint Vladimir of Kiev) chose the Byzantine rite from amongst several options. The Prince wanted a religion with ‘just one god’, in order to restore order among the various tribal factions – he apparently didn’t like the German Catholic religion, wasn’t too keen on Judaism, whilst Islam forbad drinking alcohol – something that would not have been popular with the locals. In 988 he sent emissaries to Hagia Sophia in Constantinople, and was impressed with what they told him – “Only this we know, that god dwells there (*) among men” – looking at the interior of Hagia Sophia, its hard to disagree. (*) Hagia Sophia served as an Eastern Orthodox cathedral from construction in 537 AD until 1453, except between 1204 and 1261, when Crusaders converted it to a Roman Catholic cathedral. In 1453 it became an Ottoman mosque, until 1931, when it was secularized, finally becoming a museum in 1935. It was the world’s largest cathedral for nearly one thousand years, until Seville Cathedral was completed in 1520. The choice of Eastern Christianity also reflected his close personal ties with Constantinople, which dominated the Black Sea and hence trade on Kiev’s most important commercial route, the Dnieper River. Vladimir led Kievans to Christianity via a mass baptism of the residents of Kiev, around 988, when he ordered the conversion of all Russians to Byzantine (Orthodox) Christianity. This date is often considered the official birthday of the Russian Orthodox Church, so in 1988, the Russian Church celebrated its millennial anniversary. In orthodox theology, Transfiguration is a prefigurement of the Lord’s Resurrection and His Second Coming, and of the transformed state in which Christians will appear at the end of the world. In the foreshadowing of future glory celebrated in this feast (one of the Twelve Great Feasts), the Holy Church comforts her children by showing them that, after the temporary sorrows and deprivations of the earthly life, the glory of eternal blessedness will shine forth. 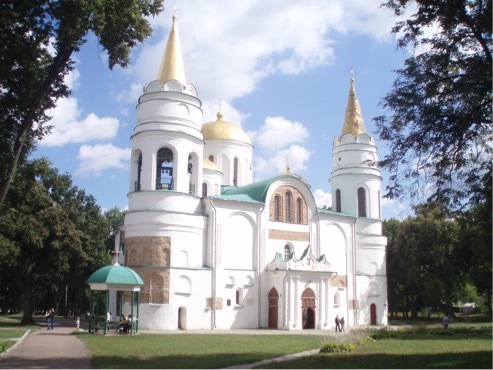 There are many such churches and the Transfiguration Cathedral in Chernihiv (Ukraine) one of the oldest. One of the few surviving buildings of pre-Mongol Rus and the oldest building in Chernihiv, construction began around 1035. Damaged in 1239 during the Mongol invasion, it was renovated in the middle of the 17th century, burned down in the 18th century and again renovated – the current exterior stems from the 19th century. Its architecture is unusual, being a mix of Roman basilica with a typical Byzantine church, three naves with three apses and five domes, and two towers at the two sides of the main facade. Jenny then introduced us to Icons, those beautiful paintings of a holy person or event, typically Mary and baby Jesus (though they can be of almost any saint or event, and it is interesting to see the many different presentation styles of the Virgin which all derive from an original by St Luke) created by an iconographer following the strict standards of the Orthodox Church. They are typically made with paint (more usually egg tempera) on wooden board or in/with other materials, including mosaic, fresco, metal and embroidery. To the Orthodox believer, they are considered a window or portal into the holy, and are traditionally unsigned, making authentication difficult, especially as they are often over painted. An iconographer carves out the surface of the wood to create a self-contained border. Several layers of gesso, a paste prepared by mixing whiting with size or glue, is applied and the image is etched onto the surface. Egg yolk and crushed mineral pigment are mixed to form tempera paint. The tempera is applied to the board in layers from dark colours to light, and completed paintings are usually sealed with linseed oil. Iconography is a living tradition, and icons today are painted in the same way that they have been for hundreds of years. The most famous is the Byzantine Vladimir icon of the Mother of God – see above – originally painted in Constantinople and brought to Kiev in 1130. After conquering the city in 1160, Prince Andrei Bogolubsky took it to Vladimir, where he had transferred his capital to, and from where the icon got its name. In 1395 it was brought in procession to Moscow, to protect the city from Mongol’s hordes, so becoming a Russian symbol of the struggle against the invading Mongols. They are usually anonymous and much copied over the years. Icons are not to be considered as works of art in any sense, which is something that can upset Christians; its seems its their efficacy that matters – how closely they can take you to god. Orthodox Christian homes often have a small worship space in their homes (the equivalent of a home altar in Western Christianity), called the icon or red corner, as famously painted by Vassily Maximov in a work entitled ‘The sick husband’. Orthodox Christian churches do the same, but on a much grander scale with an iconostasis, a wall of icons and religious paintings separating the nave from the sanctuary. Bottom: The place (or Local in English) row, sometimes called Sovereign. In the centre are the Tsar, or Royal Doors, just above which is an image of the Mystic (or last) Supper. This row has various icons as favored by each particular church, so these will vary. Customarily on the left is an icon of Mary, symbolizing Christ’s incarnation, and to the right an icon of Jesus, symbolizing his second coming. Taken together, this means that all things take place between Christ’s first and second coming. To the right of Jesus, a Transfiguration icon, if present, shows the church is named for the Transfiguration. The representation of Jesus is very often replaced by the local saint e.g. if the church is St Nicholas then there will be an image of St Nicholas. In the centre is a large icon of Christ enthroned in his heavenly court with rows of supplicant saints approaching from both sides. These could be John, the Baptist, Archangels Michael and Gabriel and then saints Peter and Paul; lastly if room permits, other important church fathers. This level depicts icons for the 12 great feats of the liturgical year, from the birth of Christ to the elevation of the cross. In the centre is usually a ‘Marion’ icon showing the Znamenie (Our Lady of the Sign in English). Forefathers: Old testament Patriarchs Adam to Moses – a biblical history of the plan of salvation. A Trinity icon is shown in the centre – old testament images show three individuals as appearing to Abraham, whilst new testament images depict the Father (an old man), Son (a youth) and Holy Spirit (a white dove). Six apostles appear to each side. Passion of Jesus: The sixth and highest row of icons not seen in all iconostases. Comprises icons depicting the passion Jesus (A scene of the crucifixion is often incorporated in the Forefathers level to save space). St. Anthony of the Caves (in Kiev) first introduced the concept of personal asceticism to Russia, which had formally become Christian just five years after his birth in 983. He chose a cave at the Berestov Mount, overlooking the Dnieper River, and a community of disciples soon grew. Prince Iziaslav of Kiev gave the mount to the Antonite monks, who founded a monastery built by architects from Constantinople – Kiev Pechersk Lavra, also known as the Kiev Monastery of the Caves (sadly much damaged with little of the original to see now, though one can go down into the caves). St. Sergius of Radonezh apparently stopped four civil wars, influenced both poor and wealthy, and organized a monastic settlement whose members, over the next 200 years, started a movement by founding 150 monasteries in the forests and 100 in the cities. He effectively wrote the rules of Russian orthodox monasticism, and founded the Trinity Lavra, which is now the centre of the Russian Orthodox Church (ROC), some 75 km outside Moscow (on the way to Yaroslavl). Saints Zosima, Sabbatius and Herman, all from Solovki (or the Solovetsky islands in the White Sea – a southern inlet of the Barents Sea) established the Solovetsky fortified monastery on the islands in 1436. This was one of the largest Christian citadels in Northern Russia which experienced several major changes and military sieges over the years, and often been used by the Tsars as a prison. Between 1926 and 1939 it was converted into a Soviet prison and labour camp, and served as a prototype for the camps of the Gulag system. We were told there are more princely saints in the Russian church than any other church – they’ve even pinched our own Patron Saint George to be their patron saint of Moscow! Saints Boris (Prince of Rostov) and Gleb (Prince of Murom), the younger children of Vladimir the great, were murdered during the internecine wars of 1015–1019, receiving the crown of martyrdom in 1015. Know as Strastoterptsy (Passion-Bearers), since they did not resist evil with violence, their relics were housed in the church of St Basil in Vyshhorod, though later destroyed. Both were canonised by the Orthodox Church in 1071 and interred at Vyshhorod cathedral; which was later re-consecrated in their name; many other Ukrainian and Russian churches were also named after them. Saint Alexander Nevsky, Prince of Novgorod, Grand Prince of Kiev and Grand Prince of Vladimir, is regarded as one of the key figures of medieval Rus. He had many military successes, but famously, with his men, he faced the Livonian heavy cavalry led by the bishop of Dorpat, meeting the enemy on the ice of Lake Peipus (the largest trans boundary lake in Europe lying between Estonia and Russia). The German knights and Estonian infantry were defeated during this Battle of the Ice, on 5 April 1242, later immortalised in 1938 by Sergei Eisenstein’s historical film drama, with musical score composed by Sergei Prokofiev. Alexander’s victory was an important milestone in the development of Muscovite Russia, and veneration of him as a saint began soon after his death. In 1725 Empress Catherine introduced the Imperial Order of St. Alexander Nevsky as one of the highest Russian decorations. During the Great Patriotic War, on 29 July 1942, Soviet authorities introduced an Order of Alexander Nevsky to revive the memory of his struggle with the Germans. St. Alexander Nevsky’s fame has spread beyond Russia, with numerous cathedrals and churches dedicated to him, including the Patriarchal Cathedral in Sofia, Bulgaria; the Cathedral church in Tallinn, Estonia. In September 2008, St. Alexander Nevsky was declared the main hero of Russia’s history, by popular vote, by the Kommersant newspaper. Alexander Nevsky Monastery monastery was founded in July 1710, seven years after the foundation of Petersburg by Peter the Great, near to the spot where contemporary Swedish maps showed the Swedish fort Landskrona had stood. The complex is home to some of the oldest buildings in the city, as well as cemeteries containing the graves of some of giants of Russian culture, including Tchaikovsky, Dostoevsky, and Glinka. In 1724, a new church, designed by Italian architect Domenico Trezzini, was consecrated and named for Alexander Nevsky, whose remains were brought to the church from the ancient city of Vladimir. The day the remains entered the new church are celebrated each year as a holiday. In 1750 Empress Elizabeth ordered a silver shrine be built to shelter the holy remains; using one and a half tons of pure silver it is decorated with symbols of the famous Battle on the Ice fought on Lake Peipus and other of Alexander’s victories. The shrine was moved to a new cathedral in 1790, and in 1797 Emperor Paul gave the monastery its current rank – the highest in the Orthodox hierarchy – and name – the Alexander Nevsky Monastery of the Holy Spirit. 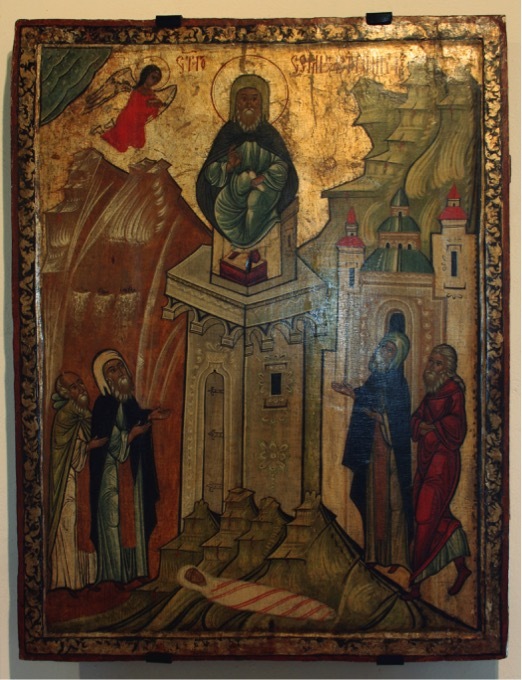 Jenny began this section by telling us about Simeon of Stylites, an Assyrian ascetic saint who spent 37 years in Aleppo atop various pillars of increasing height on platforms around a metre square, in order to get away from the ever-increasing numbers who came to him for prayers and advice, leaving him little time for his private austerities. Foolishness for Christ refers to behavior such as giving up all one’s worldly possessions upon joining a monastic order, or deliberately flouting society’s conventions to serve a religious purpose, particularly Christianity. Such individuals were known as holy or blessed fools, where ‘fool’ suggests what is perceived as feeblemindedness, and ‘blessed’ / ‘holy’ refers to innocence in the eyes of God. Foolishness for Christ is an integral part of Russian Orthodoxy with ‘fools’ representing the voice of God speaking to the people; their behaviour is neither by mistake nor by feeble-mindedness, but is deliberate, irritating and perhaps provocative, Inspired from the words of St Paul in 1 Corinthians: ‘If any among you thinks that he is wise in this age, let him become a fool that he may become wise’. We then heard about Basil the Blessed, who was originally an apprentice shoemaker in Moscow who he adopted the eccentric lifestyle of shoplifting and giving to the poor in order to shame the miserly and help those in need. He went naked and weighed himself down with chains, rebuked Ivan the Terrible, for not paying attention in church and for his violent behaviour towards the innocent. He is buried in St. Basil’s Cathedral in Moscow, which was commissioned by Ivan to commemorate his conquest of Kazan. This was originally called the Cathedral of the Intercession of the Most Holy Theotokos (Virgin Mary) on the Moat, and later dubbed after the saint. Basil was formally canonised around 1580. His feast day is celebrated on August 2. 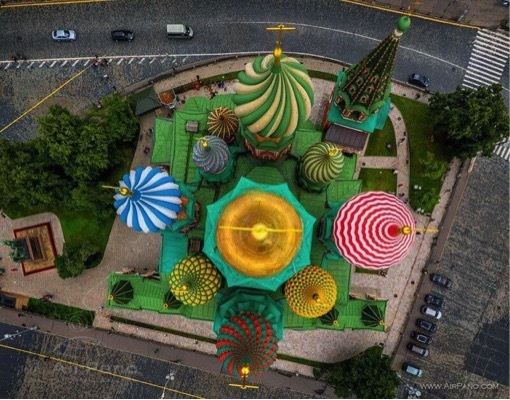 Saint Basil’s cathedral in Moscow’s Red Square is actually a church, originally Trinity church, comprising eight churches arranged around a ninth central Church of Intercession. A tenth church was erected in 1588, over the grave of venerated local saint Vasily (Basil); it is shaped as a flame of a bonfire rising into the sky, a design with no parallel in Russian architecture. Inside is a labyrinth of narrow vaulted corridors and vertical cylinders, the largest being the Central Church of the Intercession, at 151 ft tall internally, but with a floor area of just 690 sq ft.
As part of the program of state atheism, the church was confiscated from the Russian Orthodox community as part of the Soviet Union’s anti-theist campaigns, and has operated as a division of the State Historical Museum since 1928 – it has been part of Moscow’s Kremlin and Red Square UNESCO World Heritage Site since 1990. The view from the west side shows the church is in fact quite symmetrical, and not the architectural muddle which it appears to be from Red Square; Jenny than wowed us all with an aerial shot from directly above, which really shows off the design to great effect. We were then told of the Great Schism (Raskol) in 1654, which had a profound impact in Russia, causing the Orthodox Church to be split into two major factions – the Reformed Orthodox Church (ROC) and the Old Believers – a split which continues in Russia today. It occurred after a number of church ‘reforms’, when Traditionalists wishing to maintain centuries old practices (incl. seemingly trivial things such as how to cross oneself) often paid a very high price, including exile to Siberia. In 1654 a plague broke out in the capital, killing thousands. Hysteria and panic caused order to breakdown, which soldiers failed to quell because they also suffered. Many began to believe the plague was caused by the heretic reforms of Nikon – a Patriarch of the church and one of the Zealots of Piety. In the winter of 1655, Tsar Alexis faced the prospect of war against Sweden; his advisors urged negotiation but Nikon said otherwise, pushing for armed confrontation, so Alexis declared war. In 1656, facing stalemate against the Swedes, Russia lost its latest conquest in a deal, and Alexis decided that Nikon had to go. In 1657 they quarreled over the appointment of important church positions and the authority of the state over church affairs; Alexis wanted absolute rule which Nikon opposed, so Alexis began to snub the Patriarch. In retaliation, Nikon withdrew to the New Jerusalem Monastery awaiting the apology of the Tsar, delaying state affairs as many government decisions had to pass him. Alexis appointed an “interim” Patriarch, Piturim and disregarded Nikon in state affairs; he also took control of Nikon’s wealth by confiscating Patriarchal lands. He then plotted removal of Nikon, though to do so required the consensus of the Church. Alexis convened a church synod in early 1660 to discuss Nikon’s removal, presiding over and presenting two witnesses claimed had heard Nikon resigning. Monk Epifani Slavinetsky defended Nikon, discrediting the witness statements, and the synod failed to meet Tsar’s expectation. Alexis then called for a Great Synod of all Eastern Orthodox Church to remove Nikon, to be conducted in Moscow. It was planned for 1666, but before then, Alexis looked to the greatest adversary of Nikon, archpriest Avvacum, authorising his return to Moscow in 1660. For various reasons (old age) the exiled archpriest only returned in 1664; he condemned Nikon but refused to accept the reforms, so once again Alexis ordered the arrest of Avvacum. The Great Moscow Synod of the Eastern Orthodox Church finally convened in 1666, including many high officials of the Russian Orthodox Church as well as the whole Eastern Orthodox Church. Patriarchs of Constantinople and Jerusalem attended. As expected, the Synod deposed Nikon imprisoning him to the Ferapontov Monastery and demoting him to a monk. Patriarch Lokim took over as the head of the Russian Orthodox Church, archpriest Avvacum was found guilty of heresy and imprisoned in Pustozesk, where he languished in a deep hole until Tsar Feodor II ordered his burning at a stake 12 years later. The Synod maintained integrity of Nikon’s reforms, declaring the one true form of the Russian Orthodox to be the reformed one. They agreed the Tsar was above the Church, thus ending the conflict between Alexis and Nikon, but not that between Old Believers and the reformed church. Old Believers continued opposition and began to believe and spread rumours that the Tsarist Regime embodied the Anti-Christ; up to the 1690’s, many dramatically self-immolated rather than submitting to the reforms. The Solovetsky fortified Monastery rejected the reforms and began an armed uprising, so Government forces besieged it from 1668 until 1676, culminating in the death of the defenders. Some of the nobility opposed and became Old Believers, notably Feodosya Morozova, partisan of the old believer movement. Alexis arrested both her and her sister, and the arrest became the subject of the powerful painting by Vasily Surikov in the 19th century, depicting Morozova being carried away in a sled defiantly raising her hands with two fingers depicting the traditional signing of the cross (see above). They suffered torture, assault, and hunger, and in 1675 passed away, locked up in a dungeon in the Pafnutev Monastery in Borovsk. Many Old Believers fled to avoid capture, to Siberia or north towards the Arctic, to isolated communities where the government could not reach and they could continue traditional Russian Orthodox practices. Persecution of Old Believers only waivered as the government became secular under Tsar Peter the Great. By 1720, they encompassed one-sixth of the population of the Russian Empire, and today there are still Old Believers within modern Russia. In the 19th century, there was a great Byzantine revival in Russian church architecture, with new churches built in the ‘Slavic’ way. The talk now switched to the post revolution era and the impact upon the church. After the 1917 revolution, the Russian Empire was dissolved, the Tsarist Government overthrown and, when the Bolsheviks took power in October, a separation of church and state was declared. The government seized church lands and the Russian Orthodox Church found itself without state backing, whilst the new communist government declared freedom of “religious and anti-religious propaganda”. This led to a marked decline in the power and influence of the Church, which was also caught in the crossfire of the Russian Civil War that began later the same year; many church supported what ultimately turned out to be the losing side (the White movement). The Russian Orthodox Church supported tsarist Russia, creating another reason for the Bolsheviks would to diminish their influence on the Russian people and government. The official Soviet religious stance was one of ‘religious freedom or tolerance, but the state established atheism as the only scientific truth; criticism of atheism was strictly forbidden and sometimes led to imprisonment. The Soviet Union was the first state to have as an ideological objective the elimination of religion, and toward that end, the Communist regime confiscated church property, ridiculed religion, harassed believers, and propagated atheism in the schools. Actions taken against Orthodox priests and believers, in addition to execution, included torture, prison or being sent to labour camps or mental hospitals. Many Orthodox were also subjected to psychological punishment or torture and mind control experimentation, to force them give up their religious convictions. Thousands of churches and monasteries were taken over by the government and either destroyed, or used as warehouses, recreation centers, ‘museums of atheism, or even Gulags. It was impossible to build new churches. The result of state sponsored atheism transformed it into a persecuted and martyred Church; in the first five years after the Bolshevik revolution, 28 bishops and 1,200 priests were executed. In the early 1920s, Lenin expelled the leading Russian religious thinkers. Forced to leave Russia, these intelligentsia settled in various European cities and the vessels carrying them became known as the Philosophers’ ships. The main target of the anti-religious campaign in the 1920s and 1930s was the Russian Orthodox Church, with the largest number of faithful. Nearly all its clergy and many believers were shot or sent to labour camps; theological schools were closed, and church publications prohibited. The sixth sector of the OGPU (secret police), led by Yevgeny Tuchkov, arrested and executed bishops, priests and devout worshippers for refusing to hand in church valuables (incl. sacred relics). Some 20,000 people were executed outside Butovo, including many clergy, ascetics and laymen. Mass closure of churches continued until 1939, when there were only a few hundred left. In 1940 5,100 were arrested and 1,100 shot dead. The Solovki Special Purpose Camp was established in the monastery on the Solovetsky Islands in the White Sea. Eight metropolitans, twenty archbishops and forty-seven bishops of the Orthodox Church died there, along with perhaps hundreds of thousands of laity. Some 95,000 were put to death, by firing squad. Many thousands of victims of persecution were subsequently recognized in a special canon of saints known as the ‘new-martyrs and confessors of Russia. There was a marked relaxation of official attitudes towards the ROC during the Second World War, to help the morale of the people. Between 1945 and 1959 the church was greatly expanded, although individual clergy members were occasionally arrested and exiled; the number of open churches reached 25,000. By 1957 around 22,000 Russian Orthodox churches had become active, but in 1959 Nikita Khrushchev initiated his own campaign against the ROC and forced the closure of about 12,000 churches; by 1985 fewer than 7,000 churches remained active, and the number of functioning monasteries was reduced to less than twenty. Members of the church hierarchy were jailed or forced out, and their places taken by docile clergy, many of whom had ties with the KGB. After Khrushchev’s overthrow, Church and government remained on unfriendly terms until 1988. In practice, the most important aspect of this was that openly religious people could not join the Communist Party, meaning that they could not hold any political office; however, among the general population, large numbers remained religious. By 1987 the number of functioning churches in the Soviet Union had fallen to 6,893 and the number of functioning monasteries to just 18. In 1987 in the Russian SFSR (Russian Soviet Federative Socialist Republic), between 40% and 50% of newborn babies were baptized and over 60% of all deceased received Christian funeral services. In the late 1980s under Mikhail Gorbachev, new political and social freedoms resulted in many church buildings being returned to the church, for restoration by local parishioners. A pivotal point in the history of the Russian Orthodox Church came in 1988, the millennial anniversary of the Baptism of Kievan Rus. Throughout the summer, major government-supported celebrations took place in Moscow and other cities; many older churches and some monasteries were reopened. An implicit ban on religious propaganda on state TV was finally lifted, a for the first time in the history of the Soviet Union, there was live transmissions of church services on tv. Since the Soviet Union’s collapse, the role of the once-persecuted Russian Orthodox Church has transformed dramatically, and it has become a defining characteristic of Russian identity, actively promoted by the Kremlin. President Vladimir Putin, a former KGB agent of the atheist Soviet Union, now embraces his Orthodox Christianity and is often shown on national television attending church services and paying respect to the church leadership. The head of the Russian Orthodox Church, Patriarch Kirill of Moscow, is a respected member of the country’s elite. Jenny brought great knowledge of her subject and a real warmth for the Russian people, which shone throughout her talk. It is probably incredibly hard for non-Russians to grasp the scale of just what has occurred to the ROC and people of Russia over the past 100 years, particularly in a short talk. Jenny more than accomplished this difficult task seemingly easily and enjoyably – a real tour de force – and we can’t wait until we invite her back again. Geoffrey Kay will tell us about the 1951 Festival of Britain in a presentation entitled ‘A tonic to the nation’. Having previously given us a super presentation on the Great Exhibition of 1851 in 2016, this also is going to be a superb talk. Linda Sexton will tell us how the Women’s Institute helped communities cope in the aftermath of the devastating 1953 East Coast Floods.